Before you proceed: This is nowhere near finished and the UI isn't pretty. But it shows how you might build interfaces on your info-beamer hosted devices with very little code in the future. Graphical user interfaces libaries all expect you to create widgets, place them, manage their lifecycle, hide and show them at the correct time and handle their events. This is example code that shows a button to enter a "sub menu" and from there return to the "main menu". Altough both main_menu and child_menu might all each other indefinitely, thanks to the tail call optimization this doesn't result in a stack overflow. Additionally both menus seems to be causing an endless while loop. Under the hood, the coroutine feature of Lua is used. ui.run resumes the coroutine started at main_menu and ui.loop yields from the coroutine back to ui.run. Together this creates the illusion of an endlessly running UI that can immediately respond to (user) input. Creating new widgets should be easy as well. Here's how a slider looks like at the moment. local mode = state.mode or "idle"
You need a supported touch device. Right now that's either the official 7" Pi display or the CM3 PANEL. If you want to edit and extend this code, you should use the dev-mode feature so you can directly see changes you make to the code on your info-beamer hosted device. 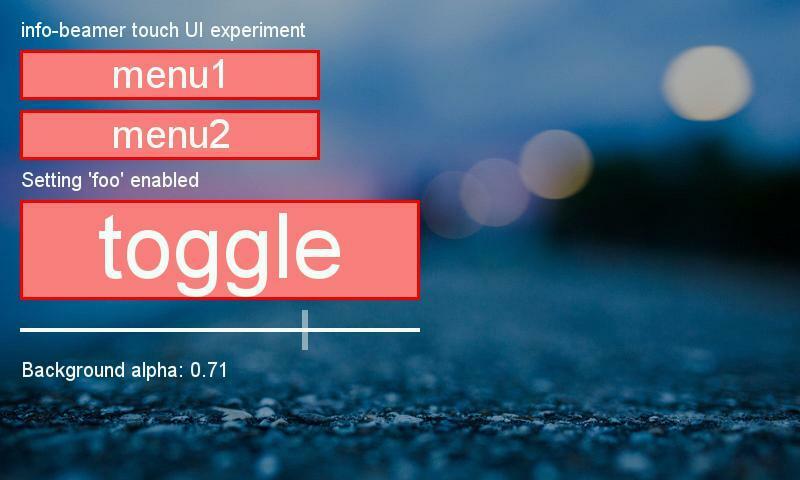 Want to run Touch UI experiments on your Raspberry Pi?